Eiji Toyoda is a former chairman of the Toyota Motor Company. His family-run business made revolutionary changes in the way automobiles were made. Eiji Toyoda was born September 12, 1913, in Kinjo, Nishi Kasugai, Aichi, Japan, the son of Heikichi and Nao Toyoda. Toyoda's uncle, Sakichi, founded the original family business, Toyoda Automatic Loom Works, in 1926 in Nagoya, about 200 miles west of Tokyo, Japan. The family was so involved in the business that Eiji's father Heikichi (younger brother of Sakichi) even made his home inside the spinning factory. Such an early exposure to machines and business would have a significant effect on Toyoda's life. Sakichi ultimately sold the patents (documents that give a person the legal right to control the production of an invention for a specific period of time) for his design to an English firm for two hundred fifty thousand dollars, at a time when textiles was Japan's top industry and used the money to pay for his eldest son Kiichiro's venture into auto making in the early 1930s. After graduating in 1936 with a mechanical engineering degree from the University of Tokyo—training ground for most of Japan's future top executives—the twenty-three-year-old Toyoda joined the family spinning business as an engineering trainee and transferred a year later to the newly formed Toyota Motor Company. The company was a relative newcomer to the auto business in Japan. Eiji worked on the A1 prototype, the forerunner of the company's first production model, a six-cylinder sedan that borrowed heavily from Detroit automotive technology and resembled the radically styled Chrysler Airflow model of that period. During those early years, Toyoda gained lots of hands-on experience. In this spare time, Eiji Toyoda studied rockets and jet engines and, on the advice of his cousin, even researched helicopters. World War II (1939–45)—when Japan fought alongside Germany and Italy against France, Great Britain, the Soviet Union, and the United States—left Japan's industry in a shambles, and the automaker began rebuilding its production facilities from scratch. But while Kiichiro Toyoda was rebuilding the manufacturing operations, Japan's shattered economy left the company with a growing bank of unsold cars. By 1949, the firm was unable to meet its payroll, and employees began a devastating fifteen-month strike (where workers walk out in protest)—the first and only walkout in the company's history—which pushed Toyota to the brink of bankruptcy. In 1950 the Japanese government forced Toyota to reorganize and split its sales and manufacturing operations into separate companies, each headed by a nonfamily member. Kiichiro Toyoda and his executive staff all resigned. Kiichiro died less than two years later. Toyota Motor Company. He was sent to the United States in 1950 to study the auto industry and return to Toyota with a report on American manufacturing methods. After touring Ford Motor's U.S. facilities, Toyoda turned to the task of redesigning Toyota's plants to incorporate advanced techniques and machinery. In 1967 Toyoda was named president of Toyota Motor Company—the first family member to assume that post since Kiichiro resigned in 1950. A year later, the two branches of the company were unified in the new Toyota Motor Corporation, with Eiji Toyoda as chairman and Shoichiro Toyoda as president and chief executive officer. The Toyodas led their company to a record year in 1984. Toyota sold an all-time high 1.7 million vehicles in Japan and the same number overseas and profits peaked at $2.1 billion in 1985. While that performance would certainly earn Toyota a mention in automotive history books, Eiji Toyoda and his company may be better remembered for a unique management style that has been copied by hundreds of Japanese companies and is gaining growing acceptance in the United States. The Toyota approach, adopted at its ten Japanese factories and twenty-four plants in seventeen countries, has three main objectives: keeping inventory to an absolute minimum through a system called kanban, or "just in time;" insuring that each step of the assembly process is performed correctly the first time; and cutting the amount of human labor that goes into each car. What Toyoda accomplished for Toyota Motor was dazzling success at a time when Detroit automakers were struggling to stay profitable. Toyota, Japan's number one automaker, spearheaded the tidal wave of small, low-priced cars that swept the United States after successive energy crises in the midand late-1970s. In addition to running the largest corporation in Japan—and the world's third largest automaker, behind General Motors (GM) and Ford—Toyoda has overseen the development of a highly efficient manufacturing system that is being copied worldwide. 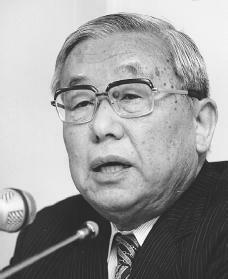 Although Eiji Toyoda gave up his post as chairman in 1994, he continues to hold the title of honorary chair of the company. Toyoda, Eiji. Toyota: Fifty Years in Motion. New York: Kodansha International, 1987. Can you provide the family tree of the Toyoda family? Toulouse-Lautrec, Henri de Truman, Harry S.